CleanTechnica contributor Kyle Field is building a new home in California. Kyle is a Tesla kinda guy. He is currently waiting for his Model 3 to arrive (today!) and really wants a Tesla Solar Roof and Powerwall to be part of his new house. Kyle says he contacted Tesla in April and was told — in so many words — “Yeah, we’ll get back to you on that but don’t hold your breath.” Since then? Nothing. Kyle’s experience is not unique. Just this week, USA Today ruffled a few feathers when it reported on Tesla’s solar business, which is off about 50% from a year ago. “March into a Tesla store and show interest in a $6,000 Powerwall, and you’ll be told the wait is six to nine months. Ask about the upmarket Solar Roof, and you’ll come away with a price estimate and a possible installation date of 2019 or beyond,” it said. In typical Muskian fashion, Elon held a splashy reveal ceremony for the Solar Roof in 2016. 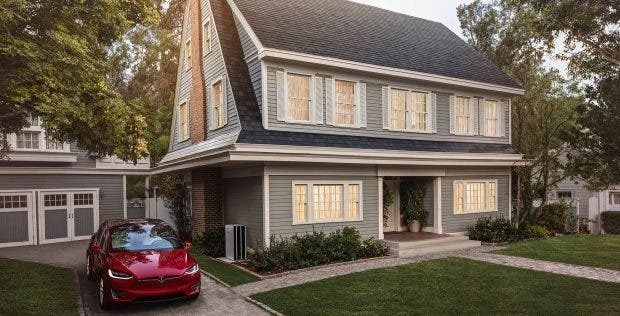 In May of 2017, Tesla announced it was ready to accept orders for the Solar Roof. In June, it claimed it was optimizing the tiles for rapid installation. In September, it announced that production of the tiles had begun at Gigafactory 2 in New York. The company made a big deal about putting kiosks in 800 Home Depot stores to attract interest from customers. USA Today says that deal has now been cancelled and those kiosks will disappear by the end of this year. Tesla has all but closed down the marketing of rooftop solar systems — once the lifeblood of SolarCity. Where once it controlled a third of the market, it is now trailing SunRun and Vivint Solar, with a market share of just 16%. SolarCity was a pioneer of the no-money-down leasing model for rooftop solar at a time when getting a loan from the bank for a rooftop solar system was difficult and uncommon. As rooftop solar prices came down and banks got more comfortable with the technology, the need for leasing — which often costs more in the end — faded. Tesla has virtually shut down all leasing programs and switched to a new business model that focuses on conventional financing. Leasing means waiting years to get paid. Financing brings cash in the door as soon as the deal closes. And that may be the key to what’s really behind the “missing in action” status of Tesla’s solar products today. It is more financially sensible for SolarCity, but means a slowdown in its business. Elon might deny it even if you forced him to ride for a week in a diesel-powered Smart car with the windows up and no air conditioning, but Tesla may be teetering on the brink of extinction unless it can bring some money in the door soon. Its rapid growth and production ramp has been using cash like liquid oxygen in a Falcon 9 rocket at launch time. Its credit rating has been lowered. The short-seller sharks are circling. Some on and off of Wall Street are nervous. JB Straubel told USA Today this week that big things are coming for Tesla’s solar and residential energy storage products. The company is taking all those sales consultants that were going to be on duty at Home Depot kiosks and transferring them to Tesla stores, where new displays are being installed. “No one should see us as stepping back from solar. In fact, it’s the opposite,” he said. “It’s like with Model 3. People have come flooding in and are waiting on the product. So now we’re aggressively ramping our capacity.” The company simply can’t keep up with demand. Some may see this as the same old story from Tesla — over-promise and under-deliver. Many of the people who stood in the rain for hours to reserve a Model 3 in 2016 may not actually get to drive their cars until 2019. Customers for the Solar Roof and Powerwall may have to wait two years or more to get the products Musk promised with such fanfare. It’s not bait and switch, exactly. Musk and Tesla get there eventually. But the constant “hype and wait” paradigm is beginning to wear a bit thin. We have seen it with the Model X. We have seen it with the Model 3. And now we are seeing it again with the Solar Roof. It’s as if no one ever read the story of The Boy Who Cried Wolf to Elon as a child. Elon Musk is a complicated person. He wears his heart on his sleeve and is constantly jumping in to help out where he can, whether it’s people in Puerto Rico who have seen their lives flattened by a hurricane, trapped children in Thailand, or people drinking poisonous water in Flint, Michigan. But his antics have a tinge of PT Barnum about them. One gets the impression he is peddling furiously to keep the Tesla balloon aloft with “burst weeks” at the Fremont factory and other Herculean efforts beyond the capability of mere mortals. Many would just like to see him tweet less and produce more. And the bigger picture is very encouraging indeed. The Solar Energy Industries Association (SEIA) estimates the number of US single-family homes with solar systems will hit 2 million by the end of this year. Within 5 years, that number is expected to grow to 4 million. “Across the country, solar really still is in its infancy,” SEIA spokesman Dan Whitten says. Anne Hoskins, chief policy officer for Sunrun, adds, “We opened up in Illinois and they’re clamoring for the service for reasons such as wanting clean energy and energy independence. We’re just at the beginning. A growing number of people want control over their electric bill.” In a recent poll by Morning Consult, 58% of respondents said they are thinking about adding solar to their homes and nearly two thirds said they approve of California’s newly announced policies requiring all new homes to have solar installations.